Dogs Bite Decatur Al: SKAMANIA COUNTY WA - A NEIGHBOR INVITED KATHRINA BATEMAN TO COME BY HIS HOUSE TO LOOK AT A LITTER OF PUPPIES ...SOMEONE OPENED THE FRONT DOOR AND OUT CAME 5 PITS OF VARYING SIZES AND MAULED HER! SKAMANIA COUNTY WA - A NEIGHBOR INVITED KATHRINA BATEMAN TO COME BY HIS HOUSE TO LOOK AT A LITTER OF PUPPIES ...SOMEONE OPENED THE FRONT DOOR AND OUT CAME 5 PITS OF VARYING SIZES AND MAULED HER! Five dogs had just broken Kathrina Bateman’s arm, savaged the flesh on her left calf and popped out her right knee. Then she drove herself, in a stick shift, a half-mile to the Skamania General Store for help. 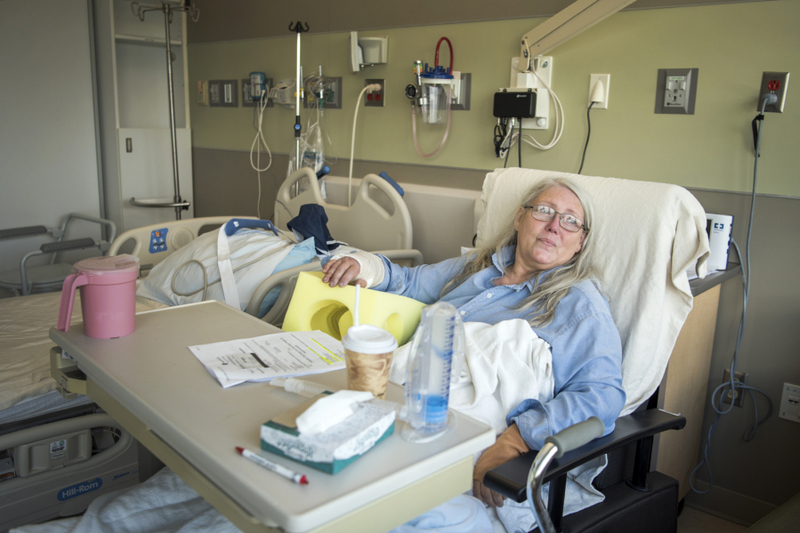 Medics brought Bateman, 57, to PeaceHealth Southwest Medical Center on Tuesday evening, after she was attacked by five dogs, which she described as PIT BULLS of varying size. She spent several hours in surgery. She met a neighbor at the Skamania General Store earlier that afternoon. He told her he had a litter of mutt puppies, Bateman said, and offered her one. She followed him up the road from the store to his house. “There was only one dog out in the yard, so he met me at my car before I got out,” she said. The neighbor’s daughter opened the door to the house, Bateman said, then five dogs poured out. “The next thing I know I’m being attacked by them,” she said. She doesn’t recall much more of what happened, save getting into her car and the dogs gnashing at her legs. “Because they were pulling me apart in two different directions,” she said. The neighbor and his daughter were able to pull the dogs away, she said, then she got in her Oldsmobile Alero. “I always knew, go to the store,” she said, having learned not to count on the ambulance drivers to find your house amid miles of poorly signed Skamania County back roads with bad cell service. She got to the store, told the clerk to call 911, then they waited on the store deck for the ambulance. The ambulance crew, surprisingly, knew her parents. She’s lived in Skamania County for 28 years, she said. The current plan was to stay with her parents, who also live in Skamania County, while she recovers. Bateman is a machinist at Pendleton Woolen Mills in Washougal, and work is taking care of her time off, she said. Sheriff’s deputies responded with the ambulance, but she hadn’t heard from them since. Her guess was the dogs were riled because of the puppies. She didn’t know about the dogs when she headed to the house, she said, just the puppies. The Skamania County Sheriff’s Office did not respond with more information about the incident before press time. Bateman’s primary concern, and ideal outcome, is insuring all her medical costs are paid for, she said. “This is going to be a bill, and I don’t know how much it’s going to affect me in the long run,” she said. “I’m not after anybody. I just know this stuff kinda happens,” she added. Bateman said she grew up a farm girl, and spends lots of time around animals. She’s had goats and chickens at her house, and is currently watching a few feral cats and mother deer and fawn that like to hang out around her 2-acre spread. She couldn’t recall having any trouble like this before. She also had a black Lab. The dog died two years ago. As for getting a puppy, Bateman said that plan is on hold for now. I wouldn't want puppies out of dogs that will attack. That's a bad line. I drive a stick shift. She would not have been able to if her left knee cap were popped out. So nice of the owner of the mauling dogs to offer her a ride to the store. Hopefully they'll put the whole lot of them down and make it the towns policy that pits are not wanted there.